Creatively Calm Studios specializes in designing premium adult coloring book sets. Each of our sets contain 3 coloring books with over 120 unique images for you to color. All of our books contain a range of designs from easy to intricate so there is always something for everyone. Take back your "me" time and de-stress with our collection of adult coloring books. Once you sign up for our Weekly Design series, you will be added to a very exclusive email list, in which you will be instantly emailed your first adult coloring page. From here, you will receive a new design every week for at least the next year. All you need to do is print, color, share. This is a limited time offer as this deal is usually only presented to existing customers, so don't miss out on your chance to relieve stress and take back your "me" time on a weekly basis. I purchased this product as a gift for my wife and she absolutely loves it! 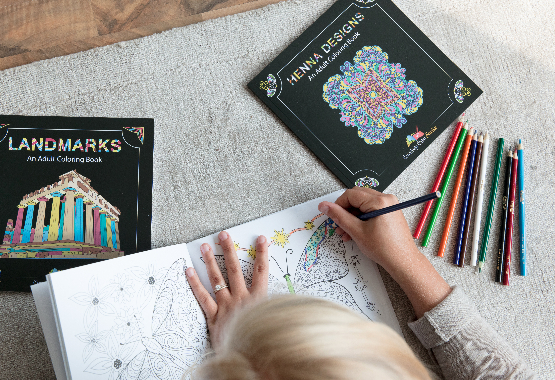 The designs are just wonderful and allow her to be as creative as she'd like, I would highly recommend this product if you are an adult that loves coloring, drawing or crafts! Love my new coloring books. Great quality. Beautiful pictures. Unbeatable price. Looking forward to ordering more books made by this company. I ordered them and am so happy with the designs. Some are really simple with large areas for shading and some designs are slightly more complex allowing for smaller areas of coloring and lots of color per page. I have ordered a second collection from this company and would highly recommend these books for beginners as well as everyone else and highly recommend Creatively Calm Studios. They are a really pleasant company to deal with and seem to really stand behind their products.